Q: What is the difference between vinyl and polypro? 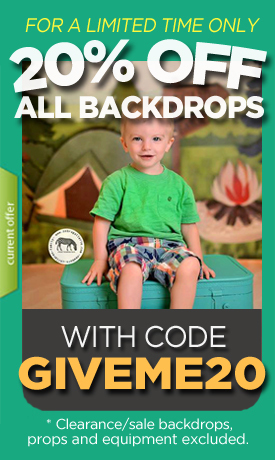 A: We sell the very best quality backdrops around. Period. We only print on the finest materials in the industry because we think you deserve the best. All backdrops are available in your choice of vinyl or polypropylene with exception of 6ft x 6ft size and larger. Vinyl is the most popular choice of the two options as it is very heavyweight, the most durable and travel friendly. Vinyl can withstand heavy handling, can be wiped clean easily and is also a better choice when used as floor drops as it can handle the use of props and foot traffic without worry. Although vinyl is widely used producing zero glare, polypro is a great alternative for photographers using strobes/flash as it has a dead flat finish and is guaranteed glare free. Unlike vinyl, our polypro material is not suggested for cake smashes or messy photoshoots as it cannot be wiped clean as easily. Polypro is lighter in weight than vinyl but is still tear proof and waterproof. Q: How fast can I get my backdrops if I order today? A: We are proud to offer the fastest turnaround time in the industry at just 1-2 business days! Upon request, we can even get your order out the door in 24 hours or less as a courtesy to speed up your delivery time. On average, please allow 2-5 business days for US deliveries and 7-15 business days for international deliveries once your backdrop order leaves our warehouse. If you need something for a specific date please contact us at Help@TheBackdropShop.com for express quotes and guaranteed service. Q: HELP! I'm in a hurry and need my backdrops rushed! Can you do this? A: Absolutely! If you have a specific date you need your order by or are concerned the above time frames won't be sufficient, simply message us and we can work with you to ensure on time delivery. We also happily offer express shipping options upon request and we can quickly quote you express shipping rates if needed. If you need something for a specific date please contact us at Help@TheBackdropShop.com for express quotes and guaranteed service. Q: How are my backdrops shipped? A: All backdrops are shipped rolled (never folded) in heavy duty cardboard shipping tubes that can double as storage! Our preferred shipping carriers are UPS, Fedex and USPS. Q: What size backdrop do you suggest? A: This is a general breakdown of what we suggest our most popular squared sizes should be used for. Use this as a guide for non-squared sizes as well. Q: What will be printed on my backdrop?" A: The watermarked image in this listing shows exactly the color and scale of the printed backdrop. The watermark shown will of course be removed from your printed backdrop. All designs are available in multiple sizes. Different sizes of the same design will differ from each other due to cropping/scaling to fit a particular size. The model images provided are for visual reference only and are not intended to represent the exact colors or scale of the final printed backdrop. All photographers use their own finishing methods and filters that may affect the final color and overall tone of the backdrop shown. Please keep in mind that the model image shown may have used a different size backdrop than what is shown in this listing. To view all sizes available for this design, you can search our shop with the item number (found at the end of each product title) and all available sizes will pull up for that design. If you still do not see the size you want, just message us and we can happily create that size for you. Q: How do I hang my backdrop? A: The most popular method of hanging backdrops is on a backdrop stand using clamps that allow you to quickly switch out one backdrop for another during shoots. Another option is to have us professionally add a pole pocket or grommets along the top of your backdrops. Q: Is there a difference between backdrops and floor drops? A: Not at all! Our drops are printed in your choice of vinyl or polypro. Get creative! Many people use our "backdrops" as floor drops and our "floor drops" as backdrops! Q: Can you create a custom backdrop for me? A: Absolutely! Just email us at Help@TheBackdropShop.com with details of what you want and we can happily quote you! For our full list of policies please see our info page.